Adbert Alzolay does not have any MLB stats for the season. Adbert was added to the 40-man roster, November 20, 2017, and is in his seventh season in the Cubs organization since signing with the club as a non-drafted free agent in December of 2012 ... Ranked as the second-best prospect in the Cubs organization entering 2018 by Baseball America ... the publication ranked him the sixth-best prospect in the organization heading into 2019 ... Was an All-Star with South Bend in the Midwest League in 2016 and with Myrtle Beach in the Carolina League in 2017 ... was the starting pitcher in the 2017 Carolina League All-Star game ... Has gone 31-22 with a 3.44 ERA (161 ER/421.2 IP) in 89 minor league contests, including 68 starts ... opened 2018 with Triple-A Iowa, but his season was cut short due to a right lat strain suffered in late May ... A native of Venezuela, he made his pro debut in 2013 with the Venezuelan Cubs rookie league team. Adbert reached the Triple-A level for the first time in his career, but had his season cut short due to a right lat strain ... went 2-4 with a 4.76 ERA (21 ER/39.2 IP) in eight starts ... walked 13 and struck out 27 ... Posted a 2.12 ERA (4 ER/17.0 IP) in his first three starts, April 20-30, walking six, striking out 14 and holding opponents to a .140 batting average ... Made his final start of the season, May 29 vs. New Orleans, tossing 4.0 shutout innings ... landed on the disabled list with a right lat strain, May 30. Adbert went a combined 7-4 with a 2.99 ERA (38 ER/114.1 IP) in 22 starts between Single-A Myrtle Beach and Double-A Tennessee ... his promotion to Tennessee on July 6 marked his first time at the Double-A level... Began the season with Myrtle Beach and went 7-1 with a 2.98 ERA (27 ER/81.2 IP) in 15 starts, including a 7.0-inning complete game shutout, May 10 at Winston-Salem ... he struck out 78 batters while walking 22 on the season... Named to the Carolina League All-Star team, and was the starting pitcher for the South team (1.0 IP, 2 ER)... Promoted to Tennessee, July 6, and made seven starts with the Smokies ... went 0-3 with a 3.03 ERA (11 ER/32.2 IP) ... allowed three or fewer earned runs in all seven starts... Was on the seven-day D.L. and missed the last three weeks of the season with a right forearm strain. Spent the entire season with Single-A South Bend, pitching a career-high 120.1 innings and earning Midwest League mid-season All-Star honors... Went 9-4 with a 4.34 ERA (58 ER/120.1 IP) in 22 games, including 20 starts ... tied for the team lead with the nine wins... Struck out 81 batters while walking 28... fanned a season-high seven batters in 6.0-scoreless innings, July 31 at Great Lakes. Went 6-2 with a 2.04 ERA (12 ER/53.0 IP) in 12 games, including three starts, with Single-A Eugene ... tied for the team lead with six wins and his ERA was the best among pitchers with at least 10 appearances... Was named Northwest League Pitcher of the Week, July 27-August 2, after pitching 6.0-scoreless innings without allowing a hit... Made eight relief appearances of at least 4.0 innings... Posted a 0.83 WHIP, the lowest mark on the team among pitchers with at least 25.0 innings pitched. In his first season in the United States, he went a combined 2-5 with a 7.90 ERA (24 ER/27.1 IP) between Single-A Boise and Rookie League Mesa... Made nine of his 10 appearances with Mesa, going 2-5 with a 8.51 ERA (23 ER/24.1 IP) in nine games, including three starts ... allowed one run in 3.0 innings in one relief outing with Boise. Adbert made his pro debut with the Venezuelan rookie league team ... went 5-3 with a 1.07 ERA (8 ER/67.0 IP) in 15 games, including 12 starts ... he struck out 61 batters and walked just 10 ... allowed just one home run. 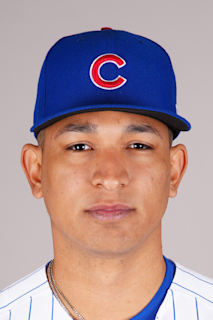 March 9, 2019 Chicago Cubs optioned RHP Adbert Alzolay to Iowa Cubs. October 3, 2018 Chicago Cubs recalled RHP Adbert Alzolay from Iowa Cubs. September 21, 2018 Iowa Cubs activated RHP Adbert Alzolay from the 7-day disabled list. May 30, 2018 Iowa Cubs placed RHP Adbert Alzolay on the 7-day disabled list. Lat strain. April 20, 2018 RHP Adbert Alzolay assigned to Iowa Cubs from Tennessee Smokies. March 9, 2018 Chicago Cubs optioned RHP Adbert Alzolay to Tennessee Smokies. November 20, 2017 Chicago Cubs selected the contract of Adbert Alzolay from Tennessee Smokies. October 9, 2017 RHP Adbert Alzolay assigned to Mesa Solar Sox. September 19, 2017 Tennessee Smokies activated RHP Adbert Alzolay from the 7-day disabled list. August 23, 2017 Tennessee Smokies placed RHP Adbert Alzolay on the 7-day disabled list. August 20, 2017 Tennessee Smokies activated RHP Adbert Alzolay from the 7-day disabled list. August 16, 2017 Tennessee Smokies placed RHP Adbert Alzolay on the 7-day disabled list. July 6, 2017 RHP Adbert Alzolay assigned to Tennessee Smokies from Myrtle Beach Pelicans. April 4, 2017 RHP Adbert Alzolay assigned to Myrtle Beach Pelicans from South Bend Cubs. April 5, 2016 RHP Adbert Alzolay assigned to South Bend Cubs from Eugene Emeralds. June 17, 2015 RHP Adbert Alzolay assigned to Eugene Emeralds from AZL Cubs. October 7, 2014 RHP Adbert Alzolay assigned to Leones del Caracas. June 21, 2014 RHP Adbert Alzolay assigned to AZL Cubs from Boise Hawks. June 16, 2014 RHP Adbert Alzolay assigned to Boise Hawks. March 8, 2013 Chicago Cubs signed free agent RHP Adbert Alzolay to a minor league contract.